Prior to the start of the BNP Paribas Open, David Goffin had never been past the quarterfinals of a Masters 1000 event. There was no reason to think anything different would transpire when Goffin faced match points against Frances Tiafoe in the Indian Wells second round earlier this month. But he saved both match points, ended up winning in a third-set tiebreaker, and the rest is history. The red-hot Belgian reached the semifinals in the desert, upsetting Stan Wawrinka in the process before succumbing to Milos Raonic. With momentum in hand, Goffin has accomplished the same feat at the Miami Open. Benefiting from Roger Federer’s withdrawal in what became a wide-open section of the bracket, Goffin capitalized on the opportunity to cruise into the last eight with straight-set defeats of Marcel Granollers, Viktor Troicki, and Horacio Zeballos. 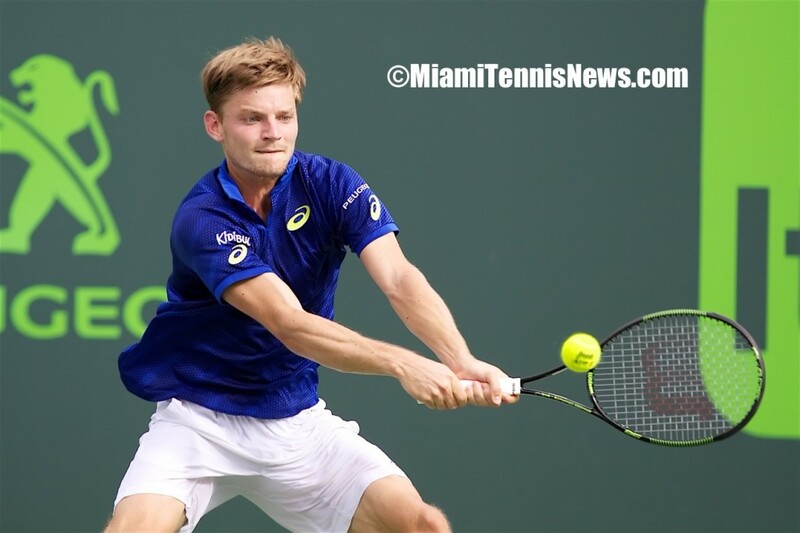 With the competition level ratcheted up in the form of Gilles Simon on Wednesday, Goffin came up with all the answers and recovered from a set deficit to prevail 3-6, 6-2, 6-1 in one hour and 57 minutes. The world No. 15 converted five of six break chances in the final two sets after missing all six of his opportunities in the opener. “The first set it was tough because it was a good set with a good level,” Goffin reflected. “Gilles was really solid on his baseline, but I didn’t serve really well in the first set. I didn’t have any free points with my serve, so it was tough. Goffin will obviously have to do everything well in his semifinal showdown against Novak Djokovic on Friday. Djokovic, who has not lost this season by anything other than retirement (to Feliciano Lopez in Dubai), cruised past Tomas Berdych 6-3, 6-3 on Wednesday night. The top-seeded Serb got broken only once, just as he did against Dominic Thiem on Tuesday. But this time around it was far more straightforward; Djokovic had to fight off a slew of break points (14 of 15 was the final tally) in the fourth round before facing only three with Berdych on the other side of the net. On the other side of the draw, Milos Raonic will battle Nick Kyrgios on Thursday while Kei Nishikori squares off against Gael Monfils. The record will indicate that Novak Djokovic made routine work of Dominic Thiem during fourth-round action at the Miami Open on Wednesday afternoon. A more accurate picture, however, is painted by both the statistics and the eye test. Anyone who was in attendance surely appreciated the entertaining affair to which they were treated, even though Djokovic got the job done in seemingly dominant 6-3, 6-4 fashion. A much different story could have unfolded if Thiem had been able to come up with the goods at the critical junctures. Instead, the 22-year-old Austrian squandered 14 of 15 break points and the only one he converted came courtesy of a Djokovic double-fault. In the opening set, Thiem survived a three-deuce game and saved one set point to hold for 3-5. He then had four break points to get back on serve, but Djokovic battled trough a four-deuce game to seal the deal. With the top-seeded Serb serving for the match at 5-4 in the second, he fought off four more break points, navigated seven deuces, and finally converted a fourth match point to triumph after one hour and 49 minutes. “Today (there) were positive and negative things,” Thiem posted on Facebook. “I can take advantage of (them) in the future…. I couldn’t take advantage of my [break points]; I only converted one out of 15; that’s [not enough], especially when your opponent is the No. 1 in the world. The hard-court proceedings will continue at least one more one more round for Djokovic, and for Gael Monfils. Joining Djokovic in the quarterfinals by also prevailing on Tuesday were Monfils, Milos Raonic, Nick Kyrgios, Tomas Berdych, Gilles Simon, and David Goffin. Monfils recovered from a set deficit to outlast Grigor Dimitrov 6-7(5), 6-3, 6-3 in a day-session match that went well into the night. After going down an immediate break in the third set, the Frenchman broke right back and earned another scalp of the Dimitrov serve at 4-3 before closing the door at love in emphatic fashion. By lasting exactly two and a half hours, it forced the Kei Nishikori vs. Roberto Bautista Agut showdown to be moved from the stadium to the Grandstand. When asked to access the unseasonal conditions in Miami Djokovic responded, “I mean, conditions were really much, much different from what I have played, you know, in previous matches. Balls didn’t bounce at all. Earlier in the day another Serbian was upset in Miami. The number 7 seed Janko Tipsarevic was bounced from the tournament by the number 11 seed Gilles Simon in three sets 5-7, 6-2, 6-2. 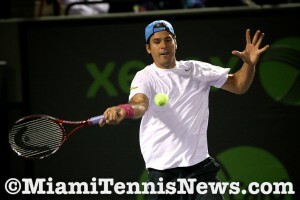 Haas will face Simon in Wednesday’s night session for a place in the Sony Open semi-finals. The tantalizing prospect of a Roger Federer and Rafael Nadal semifinal at the Sony Ericsson Open was given a leg up by Gilles Simon. This afternoon, the Frenchman retired down 0-3 giving Federer a virtual walkover into the next round. Simon produced three successive errors to hand Federer triple break point in the opening game. Then, with a forehand winner, Federer took the game. After Federer had no problem on his service game, at double break point, Simon dumped a volley into the net. 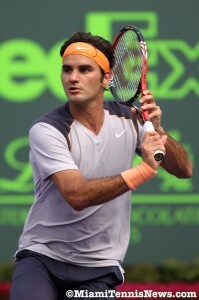 Consequently, Federer had another break and a 3-0 lead. During the change over, Simon consulted the trainer. Following a brief discussion, Simon shook hands with Federer conceding the match. The Frenchman was forced to retire due to a stiff neck. Simon explained that “ in the morning’s warm-up, I felt it. It’s a pain I have sometimes. I had it in Rotterdam one month ago. I couldn’t play either. . . sometimes I just wake up like that and cannot turn my head very much. . . I tried everything, anti-inflammatory [medications], hot cream. . . After the second forehand I tried to hit very hard; I felt [pain] very hard also. I knew I had no chance today”. Simon stated that it’s a problem which dates back at least six or seven years. In fact, the first time it presented itself on tour was at a tournament in Madrid. Simon withdrew from the qualifying rounds. Simon cited that the issue was not a consequence of the grueling fourth round match against Janko Tipsarevic. He was disappointed particularly having battled a knee injury last year which caused him to miss part of the season. Moreover, Simon had a 2-1 record versus Federer coming into today. In fact, Simon pushed Federer to a fifth set at this year’s Australian Open after being behind two sets to love. Considering their previous encounters, when Federer was asked “nice way to into the semis”. Federer responded “No, no. It’s not a whole lot fun honestly because you see the guy being booed off the court which he clearly doesn’t deserve. . . I think we played only fifteen points, so it’s not great”. Federer continued by saying “we’ve played some funny matches against each other. The five setter this year. . . The second time around in Shanghai I came off a back injury and I couldn’t really play properly as well. The first time in Toronto which was basically a normal match. . . I don’t know what to say. I’m just happy to be in the semis at this point”. Nadal and Federer have not played on U.S. soil since the ATP Masters in Miami in 2005, the first of two titles for Federer at this venue. Thus, the two meeting in the semifinals would be special. On the topic Federer stated “If I play Rafa, we have many memories from playing amazing matches against each other. It’s not even that unusual that we play each other in the semis because it happened at the World Tour finals back in Shanghai”. Also Federer iterated “I’m happy that I’m already a step further [than last year]. . . I would love to play Rafa clearly. I think it would be electric out there tomorrow night”. Tomas Berdych and Nadal clash tonight for the a place in the semifinals. Despite being tested by Kei Nishikori, Rafael Nadal managed to close out his second round match at the Sony Ericsson Open in straight sets. Nadal overcame the talented Japanese 6-4, 6-4 to get to the third round where he will face fellow Spaniard Feliciano Lopez. After Nishikori wasted a couple of break points which have given him a 3-1 lead, Nadal manufactured double break point. Nadal converted when Nishikori buried a backhand into the net. Nadal subsequently consolidated at love for 4-2. Later on, Nishikori had double break points with Nadal serving at 4-3. Once more, this was to no avail. Nadal maintained the one break advantage to seal the first set. In the second set, Nadal seized the break in the first game and guarded the advantage despite Nishikori’s formidable resistance. With triple match point, Nadal aced his rival to punctuate the set. Furthermore, Nadal said “Nishikori is a good returner. His returns are fast, deep and difficult. . . I have to improve a little bit on the second serve. The speed was [at times] 85, 88, 89, 90, 92. . . But in general, I am very happy with the match of tonight”. Never one to take his opponent for granted. Despite a 6-2 mark versus Lopez, Nadal’s assessment of the upcoming match when asked by MiamiTennisNews.com was “[it’s] important for me to play my best tennis. . . He has a very good serve, volleys well and he’s an aggressive player. Very dangerous, but if I play very well, I have my chances”. In addition, Nadal stated “I have to play aggressively with my forehand, try to move him and get to the net when I have the chance. The match will be similar [to the past ones in some ways]. Still, every match is [also] different and always difficult”. Pablo Cuevas came into the tournament with a record under 500 at 6-7. With defending Andy Roddick across the net, Cuevas must have thought that his week at its end in the second round. To the contrary, Cuevas surprised Roddick 6-4, 7-6. Cuevas caught a break in finding Roddick not at 100%. After Roddick erased a break point, he manufactured double break point the very next game. However, Cuevas found a way to turn him away. Seven days of competition have passed at the Australian Open. While Rafael Nadal has breezed through his matches to get to the round of 16, defending champion Roger Federer had a hiccup in the second round. As usual, there were a few unexpected departures in the first week. Here’s a summary of what has taken place this initial week. It’s been smooth sailing for Nadal in getting through to the round of 16. The world number one’s excellent form will come in handy as he faces 2010 semifinalist Marin Cilic. After two easy matches, Cilic edged out John Isner 9-7 in the fifth to earn a crack at Nadal. After a thrilling first round five setter against Lleyton Hewitt, David Nalbandian called it quit in the second round, four games away from being handed a straight set loss. Mikhail Youzhny also departed earlier than expected. The tenth seed was sent packing in the third round by Milos Raonic. The 20 year old Canadian qualifier with the humongous serve also ousted Michael Llodra, the 22nd seed in the second round. 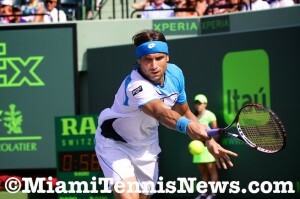 Next up for Raonic will be David Ferrer who is a relentless competitor. Ferrer’s experience may prove too much for the youngster. Thus, a Ferrer-Nadal quarterfinal showdown is the likely scenario. Without much fuss, both Robyn Soderling and Andy Murray have been taking care of business. Soderling’s fourth round match will be against Alexandr Dolgopolov. The Ukrainian upset 13th seed Jo-Wilfried Tsonga in the third round. Following an impressive second round match versus Juan Martin Del Potro, Marcos Baghdatis was forced to retire down two sets to one with a hand injury in his third round match against Jurgen Melzer. As such, Murray will battle Melzer for a quarterfinal berth. Coming into today’s rubbers with a 1-2 deficit, Serbia faced a monumental challenge in trying to win its first ever Davis Cup title. Yet, with an inspired performance from Novak Djokovic and Viktor Troicki, disappointment would not be in the cards. Backed by a raucous home crowd, the Serbs carried both singles matches against France to claim their initial Davis Cup title. On Friday, Gael Monfils put France in the driver’s seat with a 6-1,7-6,6-0 victory over Janko Tipsarevic. Subsequently though, Djokovic dispatched a pesky Gilles Simon 6-3,6-1,7-5 to square the ties at one all. On Saturday, Nenad Zimonjic and Troicki blew a two set to love advantage as Michael Llodra and Arnaud Clement roared back to triumph 3-6,6-7,6-4,7-5,6-4. With France ahead 2-1 and only three prior nations overcoming a doubles loss to take the Davis Cup, it was a near certainty that the Frenchmen would prevail. France could almost taste its tenth title, its first time since 2001. In the opening rubber this afternoon, Djokovic took on Monfils. 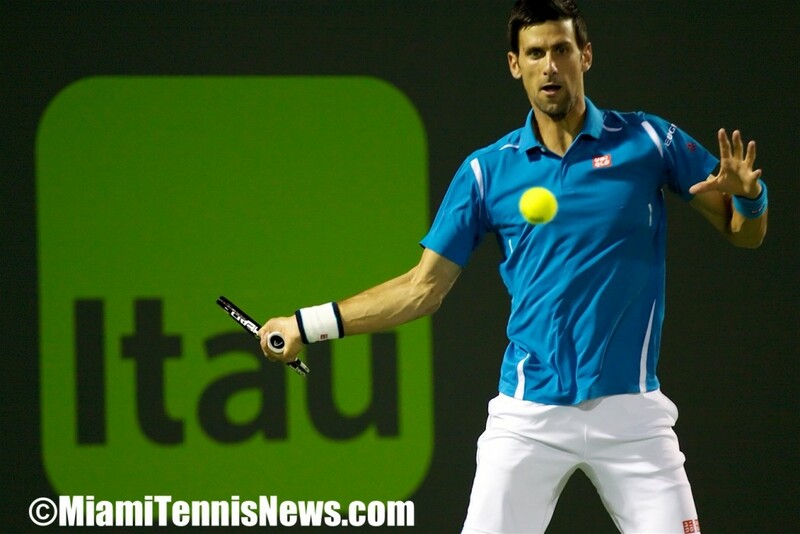 With his steady play, Djokovic quashed Monfils 6-2, 6-2,6-4 to push a decisive tie. Picking style over substance, Monfils attempted an ill advised shot at 30-0 which proved unsuccessful. A series of errors followed to give Djokovic his initial break and a 3-1 lead. After a forehand up the line winner for break point, Monfils committed another mistake. Eventually, Djokovic expanded his advantage to 4-1 and broke a second time to wrap up the first set. Despite a better start to the second set, serving at 2-3, Monfils made three consecutive miscues to go down love-40. When the Frenchman sent another backhand down the line long, Djokovic secured the break and consolidated for 5-2. With great defense, Djokovic obtained triple break/ set point. When Monfils’ slice forehand found the net, Djokovic pocketed the second set. A Monfils double fault handed Djokovic a break point to commence the third set. Next, a called double fault which would have given Serbia the break was overturned by a Monfils challenge. Two more break points ensued, but, Monfils held serve for 1 all. Then, the Frenchman turned the tables on Djokovic, breaking for a 2-1 edge. France appeared revived. However, unable to escape his nature, in selecting bad shots, Monfils saw his advantage go up in smokes. Later though, Monfils provoked a forehand mistake from Djokovic to get double break point and by crushing a forehand winner up the line, Monfils converted for 4-3. Still, Djokovic promptly redeemed himself to level the set. After a comfortable game for 5-4, on a Monfils double fault, Djokovic arrived at double match point. With Monfils netting a backhand, Djokovic gave the thousands in the arena what they had hoped for, a fifth rubber.